A boil-water order remained in effect Sunday for Boston and 29 other eastern Massachusetts communities a day after a "catastrophic" breach of a pipeline that supplies water to the area. [Update: 9:55 p.m. ET] Flooding from two days of heavy rain in Tennessee is now thought to be responsible for at least 11 deaths there, the Nashville and state emergency management offices said. The Transportation Security Administration on Sunday ramped up security screening at airports along the East Coast after an attempted car bombing a day earlier in New York's Times Square, a Department of Homeland Security official said. President Obama, who is visiting Louisiana to monitor the growing oil spill on the U.S. Gulf Coast, says his administration has mounted a "relentless response." "I think the American people are now aware - certainly the folks down in the Gulf are aware - that we're dealing with a massive and potentially unprecedented environmental disaster," Obama said in Venice, Louisiana, after a briefing with state, local and federal officials. "The oil that is still leaking from the well could seriously damage the economy and the environment of our Gulf states, and it could extend for a long time. "It could jeopardize the livelihoods of thousands of Americans who call this place home." 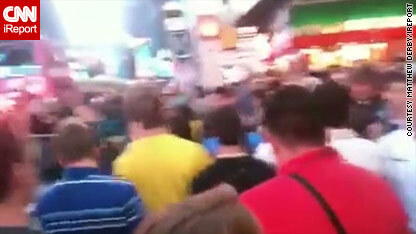 The security alert in New York's Times Square on Saturday evening did not prevent nearby Broadway shows from going on. Although part of the area was evacuated after a T-shirt vendor alerted authorities to what turned out to be an apparent failed car bombing, no theaters in the famed district were evacuated, officials said Sunday. Some shows did start late, and in some cases audiences had to leave through different exits. The Coast Guard commandant, Adm. Thad Allen, said Sunday that it was impossible so far to know how much oil will leak from a destroyed rig causing an oil spill in the Gulf of Mexico. "This spill, at this point in my view, is indeterminate," Allen said on CNN's "State of the Union." "That makes it asymmetrical, anomalous and one of the most complex things we've ever dealt with." (CNN) - At least one person was killed and 80 others wounded in a double bombing near the northern city of Mosul on Sunday, according to police. A parked car bomb and a roadside bomb detonated in quick succession in Kokjali, east of Mosul, striking buses transporting mostly Christian university students. Minorities in Iraq, especially in the north of the country, including Christians, have been frequently targeted by militant groups. Although the overall levels of violence across the country have dropped drastically compared to the height of the sectarian war in 2006 and 2007, official figures showed an increase in civilian casualties last month. At least 274 civilians were killed in April compared to 216 in March and 211 in February, according to Interior Ministry figures. HAVANA, Cuba (CNN) - Thousands packed Havana's Revolution Square on Saturday for International Workers' Day, drawing hoards of Cuban demonstrators, spectators, and trade unionists from around the world - including the United States and the United Kingdom. There was an eerie stillness to the Mississippi coast as I drove up U.S. 90 on Sunday. The long stretches of beach were almost entirely vacant, the result of rainy weather and fears that the huge oil slick moving on the Gulf of Mexico will soon foul the coastline. In Waveland, Mississippi, a single stretch of yellow protective boom could be seen flopping up against the beach as it guarded nothing at all. A few miles further up the coast were the still-visible scars of Hurricane Katrina. Outside a chuch under repair from damage caused by the storm nearly five years ago, a hand-painted sign reads: "Katrina didn't beat us." Locals don't know yet if the oil slick will get the best of them. Gus Harris, the owner of the Cajun Crawfish Shack in Long Beach, Mississippi, is stressed. Almost everything on the menu in his small cinderblock restaurant is locally sourced seafood. Even if the oil slick doesn't decimate shrimp and oyster beds, Harris already is seeing a spike in prices. He's part of the third generation of his family to live on the Mississippi coast and won't be going anywhere, he said. "I am too mean to quit," Harris said. "If this has to become the Cajun Chicken Shack, so be it." 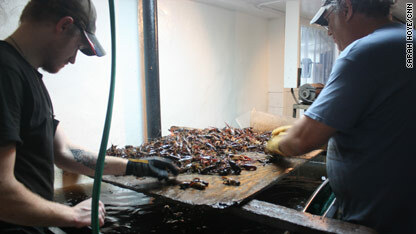 John Woods (left) and Keith Delcambre sort live crawfish. [Update: 2:30 a.m. ET] Law enforcement officials early Monday pored through evidence, including a 20-second video, after a failed car bombing attempt in Times Square over the weekend. [Update: 10:28 p.m. ET] Investigators have obtained a videotape from a Pennsylvania tourist who believes he may have caught a suspect's image on camera, according to New York Deputy Police Commissioner Paul Browne. [Update: 8:44 p.m. ET] Material found in a gun locker inside the Nissan Pathfinder was "non-explosive-grade fertilizer incapable of blowing up," Deputy Commissioner Paul Browne tells CNN. Still, the gasoline cans and propane tanks that also were in the vehicle "could have exploded with enough force to split the vehicle in two and produce a fireball," Browne said. The vehicle's contents were "capable of producing human casualties and broken windows," but did not have enough force "to take down a structure, in the opinion of NYPD bomb experts," Browne said. [Update: 7:40 p.m. ET] The Nissan Pathfinder belongs to someone who lives in the tri-state area, a New York police official tells CNN's Susan Candiotti. This contradicts what a federal law enforcement source told CNN earlier Sunday. [Update: 6:55 p.m. ET] Authorities have identified and are attempting to speak with the owner of the Nissan Pathfinder, a law enforcement source with knowledge of the investigation says, according to CNN Correspondent Deb Feyerick. - At 6:28 p.m. Saturday, a New York Police Department surveillance camera caught a dark green sport utility vehicle going west on 45th Street. - About 6:30 p.m., a T-shirt vendor - a Vietnam veteran - noticed an unoccupied SUV on 45th Street, just off 7th Avenue. The vendor alerted New York Police Officer Wayne Rhatigan. Rhatigan saw a Nissan Pathfinder with its engine running and its lights flashing. He noticed smoke coming from the backseat and smelled gunpowder. - "I told my friend, 'Yo yo look at this!' I mean it looks like fireworks inside," said Hamid Boubaln, another street vendor. "I don't know; it's hard to explain. After that, like 15 minutes later, the smoke came out. As authorities conduct their investigation into a car bomb found in Times Square, a federal law enforcement official said the incident was most similar to the events leading up to the 2007 bombing at the airport in Glasgow. Filed under: Terrorism • Times Square Car Bomb • U.S.
A fire broke out Sunday on the first floor of the U.S. embassy building in the Pakistani capital, officials said. It is too early to tell whether the incident in New York's Times Square was a terror incident involving al Qaeda or another terror network, a federal official briefed on the situation told CNN early Sunday.